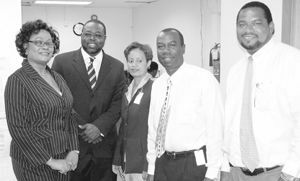 Managing Director of FirstCaribbean Barbados Ltd., Oliver Jordan who holds responsibility for Barbados and the Eastern Caribbean recently visited the St. Vincent and the Grenadines branch of FirstCaribbean. During the visit, Jordan toured the bank’s Local Processing Centre (LPC), and met and held discussions with the Bank’s staff and Local Management Committee. A spokesperson for FirstCaribbean said the focus of Jordan’s visit was to view the proposed extension to the Local Processing Centre; to interact with local management and staff; and to seek their views on the Bank’s goal of being the Caribbean’s No.1 financial services institution. As part of the discussions with management and staff, Jordan was able to find out, first hand, the needs and concerns of the staff in respect of the continued development of the bank and their role in the development process.